The Marino Tenerife is centrally located in Costa del Silencio, only 200 metres from the sea, a kilometre from a beach and 11 kilometres from the Los Cristianos beach. The apartments have a bathroom, satellite television, telephone, safe deposit box. We booked this as a fairly last minute cheap break away as we wanted a quiet week just relaxing with no pressure and not spending too much money, and this is what we got. 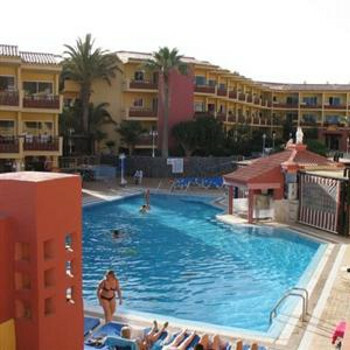 The Marino is a decent clean well equipped aparthotel in a very quiet residential area. We felt welcomed and the staff were all very friendly. It was out of season so there were a lot of older people there on longer term breaks but we had a good mix mid aged like myself (47) too. Although this area would not be popular at this time of year for younger people. The bar closed at 11pm although that did not stop the group we got friendly with as we were happy to sit later in the evening (much later) with some bottles around by the pool chatting a having a laugh. It was just what we were looking for. We could have got the bus to the other resorts but were happy lazing around the pool for the day and then going for a walk and eating out in the evening. We will be going back for another relaxing time next year if not sooner. overall the staff were friendly and helpful, exept for one of the managers who was rather abrupt and could seem rather rude. our appartment was situated inside a little court yard which was very pleasent if you don't mind birds flying around and making quiet a lot of noise at 5.30am. The appartment was clean, though like others have said it could do with a little up dateing, there was also a washing machine in the appartment which we found useful. The appartment overlooked the road, but this wasn't to busy so there was little traffic noise. We ate in the complex resturant only twice, the food would have been good value if it had been served hot. also if you are arriving in the evening the complex shop shuts fairly early so you may need to go down to nettos for basics, plus its the cheepest place to shop. we had a fairly relaxing holiday at this hotel. Overall, the hotel was pretty good, it just needs a lick of paint. The rooms were nice and big and they had everything you need. Just returned from a great week at the Marino Tenerife Hotel, Costa del Silencio. The hotel room was very spacious and fully equipped (even though we were half board) and was cleaned every day. Towels changed several times during the week. Bed was a sofa bed in the lounge which we left made up as there was plenty of room. Food in the restaurant was excellent - wide variety of choices for both breakfast and dinner, and as much to eat as you wanted. Entertainment most evenings in the Koko Bongo nightclub. Swimming pool was great and kept lovely and clean. Six minutes walk from the hotel was a bus terminus from where you could catch a bus to anywhere on the island. All in all a very positive experience and at a very reasonable cost.